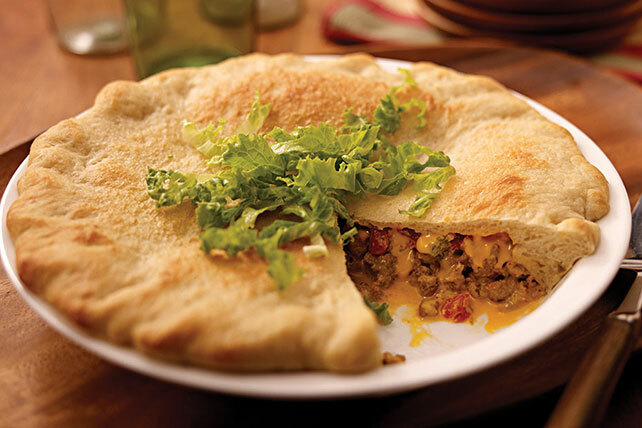 Put refrigerated thin crust pizza dough to work in a different kind of pie! This one is spicy with green chilies and cheesy with VELVEETA. Drain tomatoes, reserving liquid. Brown meat in medium skillet, adding reserved tomato liquid for the last 5 min. ; drain. Return meat to skillet; stir in half the cheese sauce. Unroll pizza dough; cut in half. Press half the dough onto bottom and up side of 9-inch pie plate. Spread meat onto bottom of crust; top with tomatoes and half the remaining cheese sauce. Roll out remaining dough to 9-inch circle; place over pie. Seal edges with fork. Bake 15 min. or until golden brown. Top with lettuce and remaining cheese sauce. Let your kids help assemble this delicious easy-to-make pie.